Abstract. 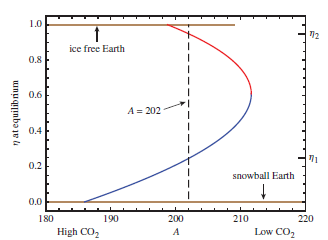 Has the Earth ever been in a snowball state, its surface completely covered by glaciers? Short of this, have glaciers ever descended to tropical latitudes, leaving a narrow strip of open ocean water about the equator? Can mathematical models of climate accessible to undergraduates shed light on these possibilities? Here, we present a dynamical systems approach to climate modeling by considering the questions posed above. Techniques from dynamical systems have recently proved successful in the study of climate, to the point of meriting an op-ed piece in the New York Times in 2012. Our focus is on the insight the simplest energy balance models provide into the behavior of large scale aspects of climate, such as the position and movement of glaciers. Along the way, we highlight aspects of this approach appropriate for the undergraduate curriculum.